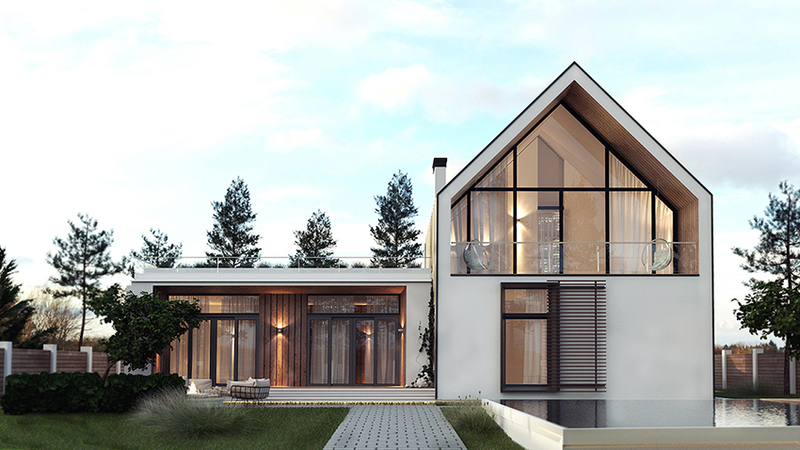 AR House is a first project of ready-made standard houses from BuyWoodHouse catalog with Augmented Reality presentation; the project created in the format Active House vision, and adapted to the Ukrainian market. 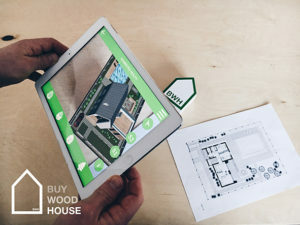 BuyWoodHouse is a collaborations between architects IK-architects, who designed AR House, and developers CrazyGames made it alive, through the using Augmented Reality (Augmented Reality). We also developed mobile application as one of the ways to represent our project to a client (IT-company from Ukraine) ; it is available to download on AppStore (BuyWoodHouse). 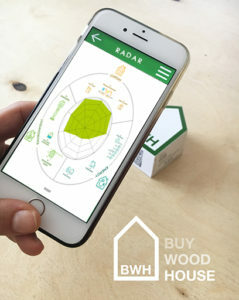 The high quality graphics and user-friendly interface of BuyWoodHouse App turns into entertaining toys for the customer, builder and investor. 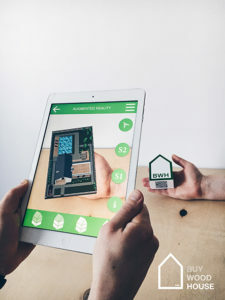 You just need to install the application on the device and print out the layout of AR House , which serves as a marker. 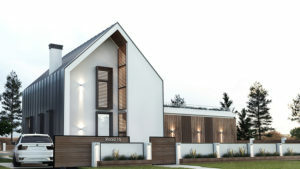 By running the application and pointing the camera at the marker you get a realistic looking project of a private house, worked out to the last detail. switching between day and night view; you can still carry out a “walk” around the object, and of course look at the visualizations. 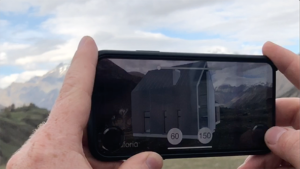 You can also try on AR House on your plot by scanning the ground, as first point, and than you will see the real size house on your construction side. We are focused on active house vision, that is why your are able to check RADAR for AR House in BuyWoodHouse App. 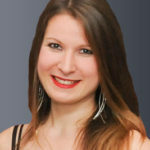 Augmented Reality technology is a great for active house vision. 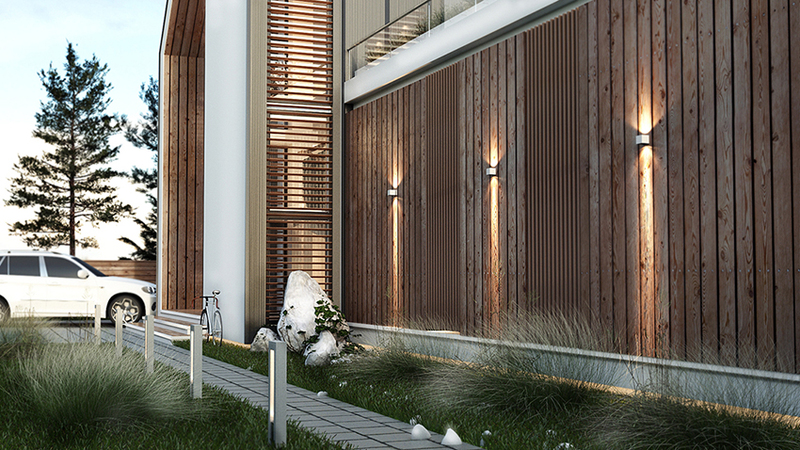 The quality of natural lighting is one of the main criteria for AR House. The main orientation of the living rooms is southeast, and south. All windows oriented to the south are equipped with sun curtains that controlled through a smart system, which makes it possible to regulate the sun’s exposure to the best in summer, and in winter, given the different angle of incidence. Glazing is 41% of the total floor area, which makes it possible to achieve 6.5% DF. The program Vetlux carried out the calculation of these indicators. All main rooms have more than 10% of probable sunlight hours. 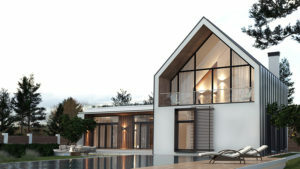 Temperature: AR House provides for 2 temperature regimes, which makes it possible to make a comfortable penetration in the building (+26 in the summer; +21 in the winter). In the summer period, natural ventilation provides through the living room window and the roof window, so there is a natural airing of the room, without drafts. Another indicator of the quality of life in AR House is the level of CO2. 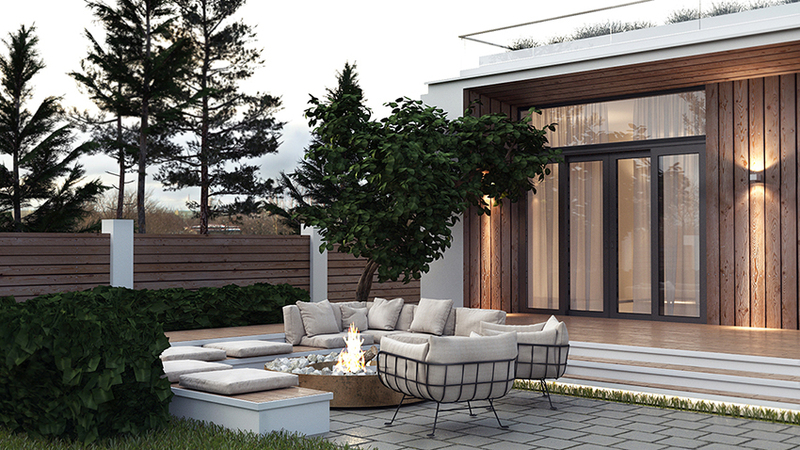 The private house is equipped with CO2 sensors, which synchronize with the ventilation system and regulate its operation. The CO2 reading taken before the project is no more than 800 ppm. In the summer, this indicator can also achieved through natural ventilation. The calculation of energy consumption showed an excellent indicator for Ukraine (taking into account the existing tariffs for electricity), and the AR House consumes about 51,21 kWh/ m2. 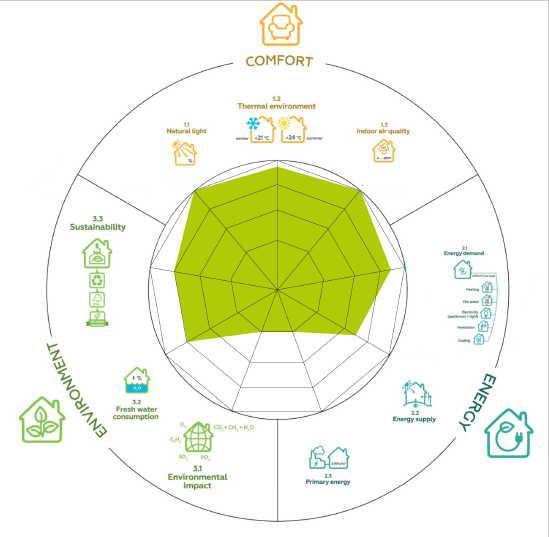 It makes possible to classify AR House in class A on energy efficiency. – 19 roll photovoltaic (1roll size is 1000х5000mm) are built in the seam eastern slope , which produce 65 % of renewable energy. 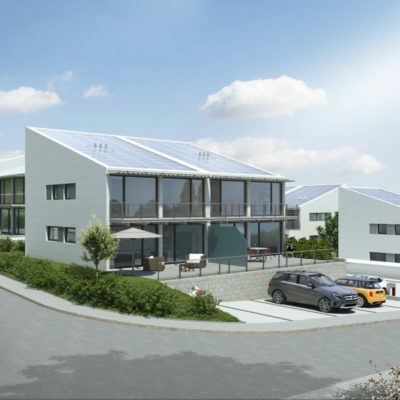 We chose built-in only photovoltaic that built in the seam roof, because this is the most technological solution for energy supply which harmoniously fits into the overall architectural concept. 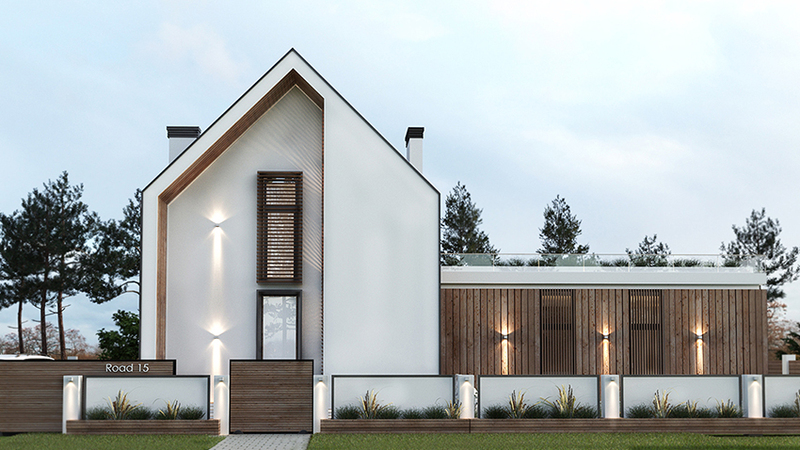 For AR House, very important aspect is the harmonious balance between the technologies of the active house and a high-quality architectural solution. Impact on the environment in AR House is minimized. Co2 emissions into the atmosphere are less than 7,5 kg/m2 per year or 1,1 ton per year. Freshwater consumption in AR House is reduced on 30 % in comparison with local legislation 55 liters hot water per person per day, 80 liters cold water per person per day. In AR House it’s less through water saving taps and inhabitants responsible water using. The AR House also provides Gray Water system for toilets and domestic needs, collecting water through a system of hidden gutiers on a pitched roof. Further, water enters reservoirs where it is coarse and is ready for use. For the collection of rainwater in reservoirs under the ground, for further use – for watering plants. – 90% of wood applied in building from local forest certified by FSC.